Dr Paul Monty died at approximately midnight (New York time) on Saturday, September 8, 1986, in Long Beach Hospital, after a long and painful battle with a debilitating disease. However, it was only his corporeal body that left, since the lives of everyone of us in the U.S. who has anything to do with Middle Eastern dance — from performing to teaching, writing, merchandising, even playing their music have been forever touched by Dr Paul. Sometime around 1971, Paul Monty saw Middle Eastern dance for the first time. It changed his life and, as a result, ours as well. After hearing all the slurs and snobbish, snotty misconceptions that the misnomer “belly dance” brings to the unenlightened mind, he was thoroughly, thrillingly surprised when he was dragged, unwilling, to a Christmas party in New York City which featured Middle Eastern dance. Realizing that this fabulous, complicated, classical ethnic dance form was being given very short shrift by the rest of the dance and art world, he determined to set the record straight. As vice president of the main chapter of the National Association of Dance Affiliate Artists, and president of its four-day dance seminars for teachers, he hired a Mideastern dance teacher for their convention. The organization tried to have him fired as a result. How dare he hire a “belly dancer” to teach real dancers! But he fought the good fight and won. They came to scoff and went away praising. Over 100 teachers showed up, when the usual attendance had been twenty to thirty. Seeing the amount of interest, he decided to try his hand at producing Mideastern dance seminars. The rest is history. He opened the doors and made us master teachers: Serena, Ibrahim Farrah, Sergio, Cheri Miller, Elektra, Jemela Omar, Jamila Salimpour, Dahlena, Badawia, myself, etc. Others liked the idea and set up their own seminars, hiring the “master teachers” created and accredited by Dr Paul and giving local talent the chance to emerge in the concert and hafla settings accompanying the seminars. For many, it was their first taste of the real art and technique involved in Raqs Sharqi and the rich variety of ethnic dances from the Near and Middle East and North Africa. It created a “sisterhood” to which male dancers were welcomed, gave rise to a whole new genre of merchant, spread the word about new, specialized publications concerned only with Mideastern dance and culture. It was at a Paul Monty seminar that I was asked to “show us” the dances and things I described from my own research and performance journeys “Over There”, and so I organized the first dancer’s tour to Morocco. Almost since the day after we met, Paul had been after me to put all my research and experiences in writing. He said I should go for a Ph.D. I told him it wasn’t an accepted topic. He said, “Okay, I’ll make it accepted.” never expecting the academic and bureaucratic opposition he was to encounter every step of the way. He fought and got his second M.A. and started to go for the Ph.D. I was his official consultant for the thesis, as an already acknowledged leading authority in history, culture, etc. in this field. Dr Patricia Rowe, Head of the Dance Department at New York University, was the head of the examining committee. Unbeknownst to each other, we each determined to keep him going as long as possible by arguing each point with him, suggesting tangents, books to read, additions: giving him incentives and energy. It succeeded for three years — much more than the doctors who were treating him had expected. When it was evident that we could stall no longer, Paul Monty defended his thesis on April 29, 1986 and emerged Dr. Paul Monty, having established the topic of Mideastern dance as worthy of recognition on the highest academic level. During an interview afterwards with John Sirica, a reporter for Newsday, Dr Monty was asked what his reactions and feelings were, when he was first told of his imminent death. Technical facts: Dr Paul Monty was born in 1940, the only child of Helen and Reg Monty of Norwich, Connecticul. He started tap at the age of eight to strengthen weak ankles, went on to ballet at twelve, left home to audition for Broadway shows and the Ice Capades in the mid-’60s. Dr Paul Monty is survived by his parents, fellow teachers, friends, and thousands of dancers, some of whom were never fortunate to know him personally, but all of whose lives are made richer by the vary fact that he lived. We love you, Paul, and I’m thankful that we had a chance to show it. Hospitalized with AIDS, Frequently Tethered to an IV, a Determined Man Worked Toward His Doctorate. Not 10 minutes later, Patricia Rowe opened the door to the Payne room and strode toward Monty with her right hand outstretched. “Dr Monty,” she said quietly, “please join us,” and at that Monty draped his slender arms over Rowe’s square shoulders and begn to sob. If Monty, 46, was crying like a kid it could be excused because, against very long odds, he had done what he had set out to do: Tethered to intravenous tubes at the Albert Einstein College of Medicine in the Bronx, as he wasted away with AIDS, he had researched and written much of a 400 page tome on belly-dancing. “I had people for support. . . [who said], ‘You are not going to die untill this is finished,'” Monty said as he sipped hot tea and smoked a cigarette in a coffee shop near the university. What Monty contributed to world knowledge was a 379 page thesis detailing the history of belly dancing in America. A chronological and sometimes colorful account, the dissertation traces the evolution of belly dancing from the late 1800s, when Det. Antonio Vachris made his name by rounding up “coochee-coochee” dancers at Coney Island (“Vachris Danced in Court; He Wins Applause at the Seaside Resort”read the headline in The New York Times the day after Vachris demonstrated the dance in court) to the 1970s when, Monty’s research found, belly dancing became more popular and respectable in the United States. The Ph.D. process is always grueling, but in Monty’s case it became immensly more difficult because of his illness. Even though he still was healthy, it took Monty six years of course work at NYU’s School of Education, Health, Nursing and Arts Professions before he could begin his thesis. By July 1985, when he presented his proposal for the belly dancing thesis, Monty was experiencing an increasing shortness of breath. Doctors attributed his condition to asthma. In August, a panel of professors rejected his proposal, saying they did not consider belly dancing to be its own creative art form. By that point, Monty had difficulty turning his head without gasping. But he wasn’t so sick that he couldn’t protest the panel’s rejection. Monty had AIDS, acquired immune deficiency syndrome. The diagnosis was made in September, 1984, at South Nassau Communities Hospital in Oceanside after he checked in with what turned out to be Pneumocytis carinii pneumonia, a rare disease associated with AIDS. At the time, Monty was one of only about 50 people in Nassau County who had come down with AIDS, which destroys the body’s immune system. Since then, 68 additional Nassau residents have been diagnosed as having the syndrome. The dance department finally accepted Monty’s proposal last summer, at about the time he checked into Einstein, again with pneumocystis. He stayed two weeks and, oddly, Monty says that such periods represented blessings of sorts because he was able to concentrate fully on his research. As he lay in bed, he would often consult by telephone with belly dancer friends of his. . . . Monty had been enthralled with belly dancing since he first watched a performance at a little club next to the Port Authority bus terminal in the early 1970s. 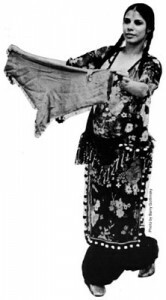 Morocco, another Middle-Eastern dancer, also helped Monty with his research. At 1:15 p.m. on April 29, Monty slumped into a blue wing chair in the Payne room to defend his dissertation. He wore a gray, pin-striped suit that hung loosely from his shoulders and thighs, and a black-and-gold brocade tie. Seated around an oblong table in front of him were Rowe, chairperson of the Dance and Dance Education Department, and four other NYU professors.Before long, the room became stuffy. But because of the noise outside on Washington Square, the windows could not be opened, and the air conditioner could not be turned on because, as Rowe pointed out, “it’d be too much on” Monty. One professor complained that the thesis was too much of a chronology, saying, “I kept saying to myself, I wonder why I’m reading this. . . why is he telling me all this?” another wanted to know more about male belly dancers. After about an hour and a half of this, the professors asked Monty and a group of friends including Morocco and Serena to leave the room. The deliberations apparently went smoothly, because after only 10 minutes, the professors agreed to award Monty his doctorate. “Did we give him the degree?” Rowe said later when asked whether Monty’s condition had played a part in the panel’s decision. “By no means. He earned it.